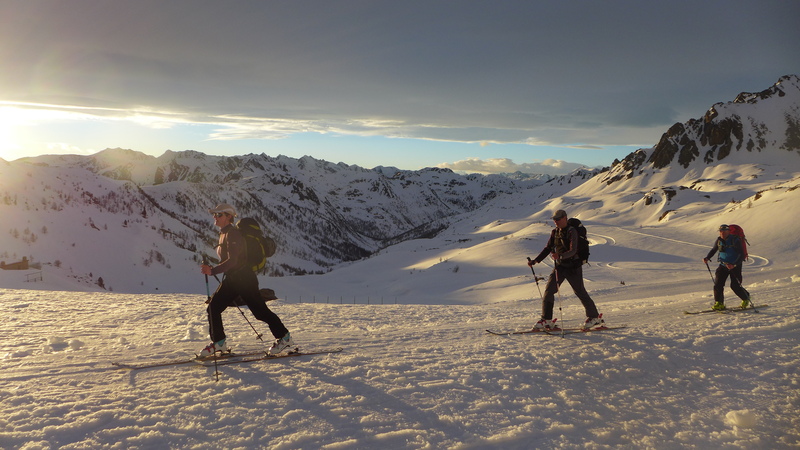 It is now a month since the final team from Exercise Alpine Arc arrived at the shores of the Mediterranean; successfully completing the final kilometres of an extraordinary ski-journey through the European Alps. A journey which began in Puchberg am Schneeberg in Austria before winding its way through 1100kms of snow-locked mountains; accumulating almost 80 thousand metres of ascent and descent before arriving in Menton 82 days later. The idea for Exercise Alpine Arc 2015 had been inside me for years. As a Reservist Officer with Oxford University Officer’s Training Corps I have organised and run a good number of challenging ski-tours, but it wasn’t until I qualified as a British Mountain Guide in September 2013 that I found the courage to commit to organising an expedition of this scale. 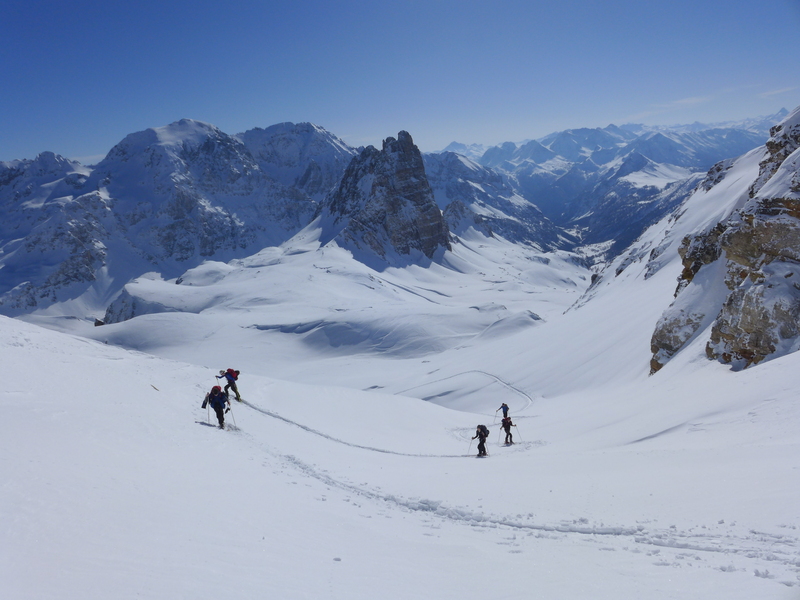 The aim of the expedition was for a British Army team to traverse the entire European Alpine chain on skis during one winter season. Such a journey has been completed before by other groups, but never by a Military team regardless of nationality. This would prove a considerable challenge, not just physically and mentally for those taking part but also logistically for those involved in making it happen. 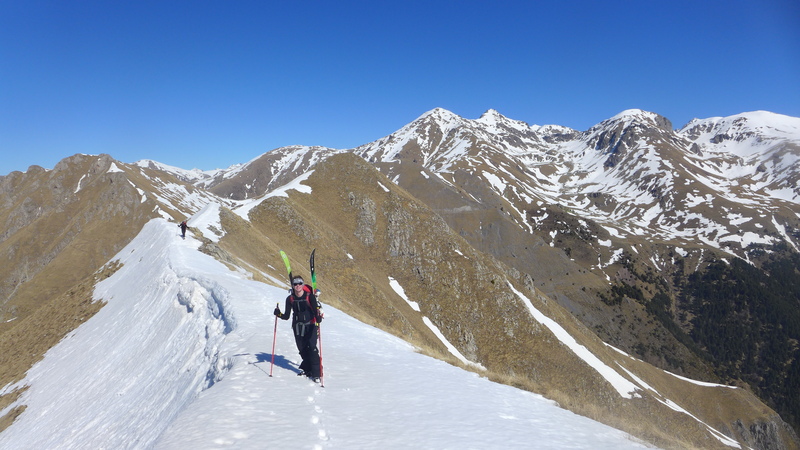 The practicality of such a long ski traverse crammed into a single winter meant that the majority was conducted during high winter; those months of the year when the snow pack does not stabilise as quickly due to the colder temperatures which meant the constant concern of higher avalanche risk. Fortunately I have a very supportive, positive and forward thinking Commanding Officer in Lt Col Simon Mason who right from the conceptual stages of the expedition backed me one hundred percent. Without his belief, hard-work and support behind the scenes Ex Alpine Arc 2015 simply could not have happened. Similarly on the financial side of running a big expedition like this, it was never easy. There were many times when I simply had to have faith that it would all come together somehow, through hard work and inspiring enough people to believe. Fortunately just at the time the Austrian Army told me that they would have to charge for the use of Austrian Military Mountain Guides and needed me to sign an agreement that I would pay this, the Ulysses Trust came on board with a firm guarantee of this amount as a booster grant for the expedition. Their belief and encouragement has been one of the most positive and uplifting aspects of the whole planning process for me. I cannot thank the Ulysses Trust enough for their firm and substantial backing, unwavering support and shared adventurous spirit! I was also fortunate to win the support and endorsement of Gen Sir George Norton, who enthusiastically came on board as Patron of the expedition. His firm belief in the value of adventurous training for Service personnel and his quick recognition of the considerable challenge all participants would face helped keep my morale up throughout the 18 months of planning and organisation. I divided the journey into 11 stages of approximately 8-days duration that ran sequentially through the winter. Each stage was undertaken by a different team of 6 skiers, sometimes from the same unit but mostly formed of individuals from different units. 58 British military personnel took part in; 29 Regular Army, 27 Reservists and 2 from the RAF. Sadly some of the available places on the expedition were not filled and this has been my greatest regret. I planned fixed start and finish points for each stage in order to simplify logistics but within each stage the itinerary was flexed to take account of the weather and prevailing avalanche conditions. The expedition was supported on the stages in Austria, Switzerland and Italy by a Mountain Guide provided by the respective host nation military. 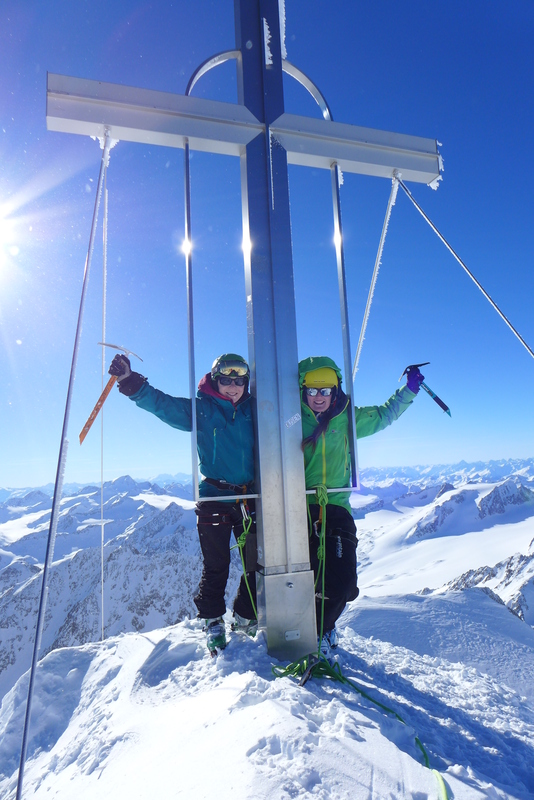 In Austria I worked alongside Military and IFMGA qualified Guides who all proved to be both highly professional and excellent company. My deep gratitude and lasting friendship goes to Stefan Redtenbacher(1&2), Gregor Haas(2&4), Daniel Ploner(3), Andy Eicholz(4), Sepp DelMarco(5), Harry(5), and Klaus Zweiker(5). The AUT Forces also kindly provided accommodation for the Support Team in local barracks following the route. 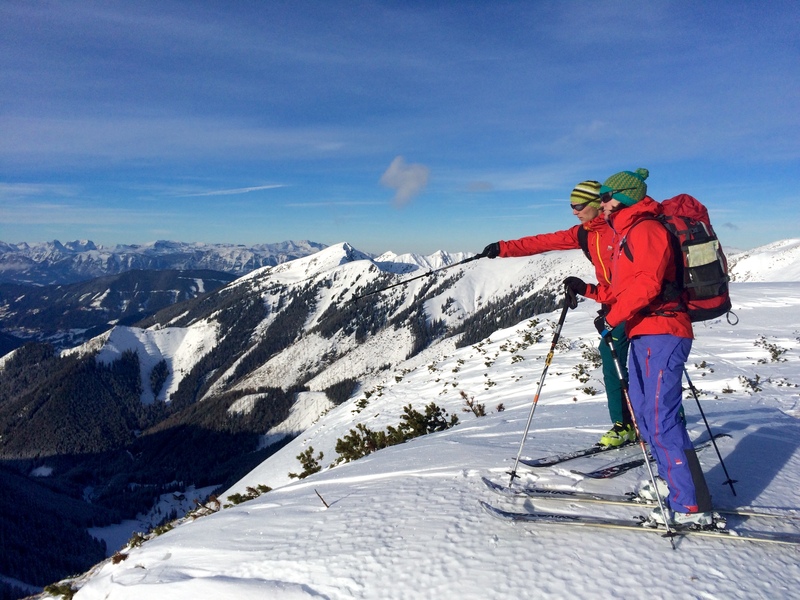 Switzerland provided IFMGA Mountain Guides Thomas Villars(6), Stephan Ruoss(7) and Johann Filliez(8) to join us; proving invaluable with their detailed local knowledge of the terrain, conditions and local history. They assisted our safe passage through the Swiss mountains despite very difficult conditions, particularly during stage 8 which resulted in many changes to the planned itinerary. The Support team were also kindly accommodated in barracks in Chur, Andermatt and Sion during the expedition’s passage through Switzerland. All this support from the Swiss Armed Forces was graciously provided as a special sign of support for constructive bilateral military relations between GBR and CHE. Without this the expedition would not have been so successful or as rewarding to the British service personnel who took part. Therefore we owe a special thank you to the Commander of the Swiss Army, Lt Gen Dominique Andrey and to Special Officer Jean-Louis Hug for arranging this. 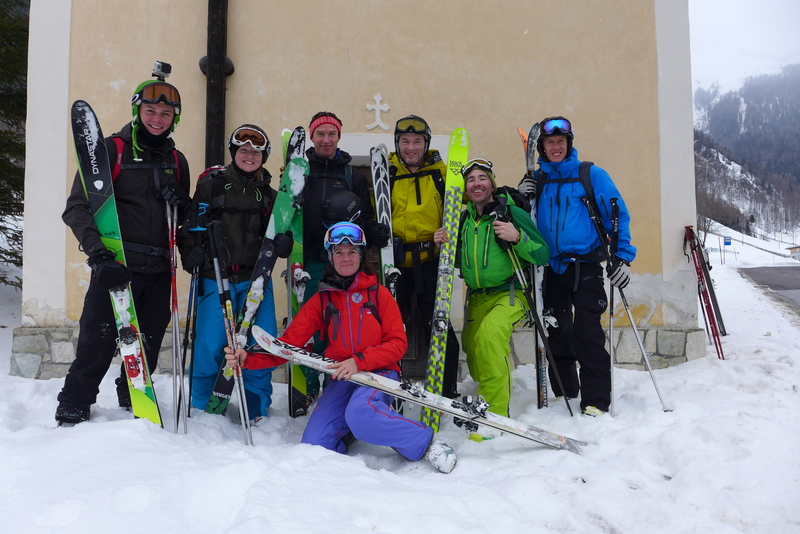 In Italy from the Grand St Bernard Monastery to the border with France Valsavarenche/Vanoise the team enjoyed the good company of energetic Italian Military IFMGA guide Loris Buzi. Keeping up with his fast transitions and enthusiasm for red wine proved a challenge. 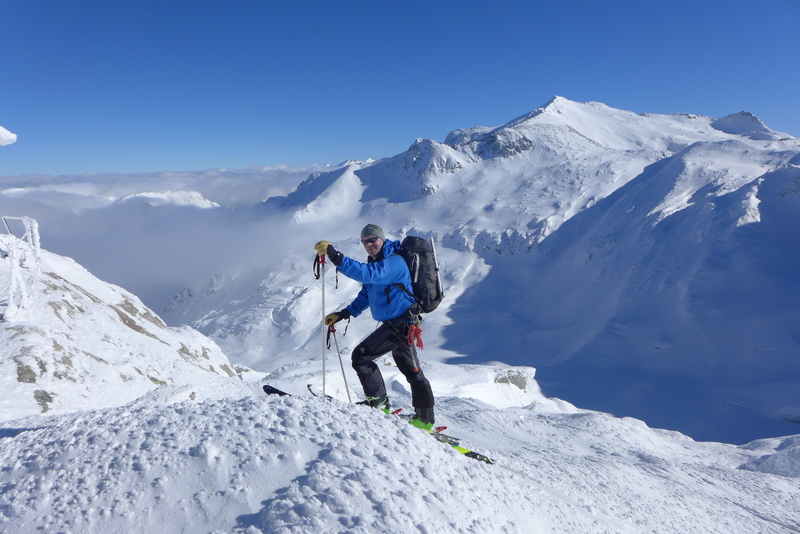 For the last days in Italy Ettore Taufer joined us, allowing us to benefit from his detailed local knowledge during our passage over the complicated terrain on Mont Rutour and moving us safely into France. For the final two stages through the Vanoise, Cerces, Queryas and Mercantour it was a great shame that France was unable to provide any support to the expedition. Fortunately I know these French sections of the Alps rather well and we were able to make a very pure ski-traverse through this area involving practically no road moves at all. The whole expedition was supported logistically by three young officers to whom I remain indebted for their flexibility, hard-work, professionalism and good humour. Ocdt Sam Davies from Oxford UOTC and 2LT Rupert Knight and Ocdt Simon Prince from Wales UOTC formed the “Support Team”. This was the vital beating heart of the expedition, coordinating and executing all necessary in-country logistics. Their responsibilities were many and varied, including picking-up each new team from the airport, issuing and maintaining equipment, report writing, food resupply of the main team, updating the website and Blog and dealing with any and all unforeseen problems. The three months of Exercise Alpine Arc 2015 now form such a rich and vivid collection of memories for me that it is hard to know where to begin sharing with you what happened. The hard facts you already know; the distance, the ascent and descent, the days and weeks of effort involved… To gain more oversight of this you can always visit the Alpine Arc expedition website if you couldn’t follow our progress at the time. And of course we did complete the aim of the expedition, and with fewer significant changes to the itinerary than I had anticipated during the planning process. However there is so much more to the expedition left unsaid. So many experiences shared along the way, with each team and the other guides with whom I worked. Memories interwoven into such a vast fabric of experiences, and so completely, that it’s difficult now to identify a single thread on its own. In fact I can sense a resistance inside me to try to do so. The physical effort involved and the deep satisfaction of spending three months engaged in a single challenge. The feeling that each day we arrived a little closer to this goal. Sensations of warmth and of cold, of excitement and of fear, of satisfaction, success, of frustration and disappointment. All shared with an amazing group of people who largely arrived not knowing each other, worked hard as a team and left as friends. These memories have now become part of who I am and of what drives me forward to meet the future and I’m sure that the same is true of every single person who was part of the expedition. Every day I learnt something new; about the mountains or about those around me with whom I shared this unique journey and also at times about myself. This stands out in my mind as the best part of the experience as a whole. I have learnt so much during the course of this winter that it has further opened my eyes on just how rich and varied and amazing a world we live in – and how much is to be gained if only you are prepared to take on the challenge. It seems true that we value most that which we have fought hard to achieve. 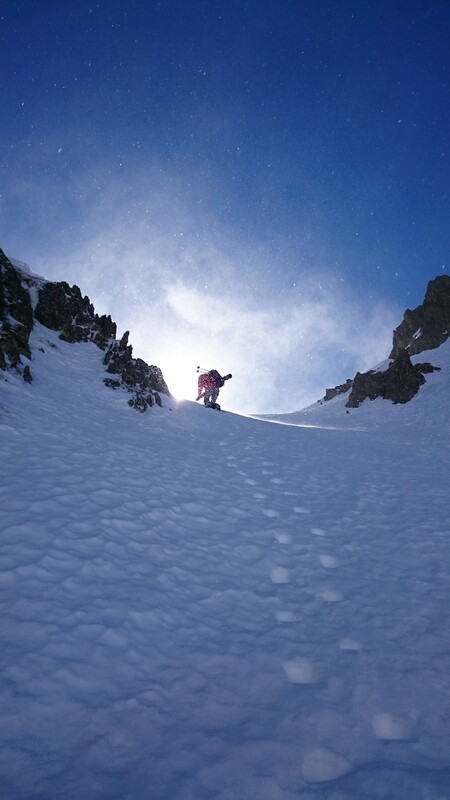 Exercise Alpine Arc was for me an unspoken dream which I decided to commit to making real. 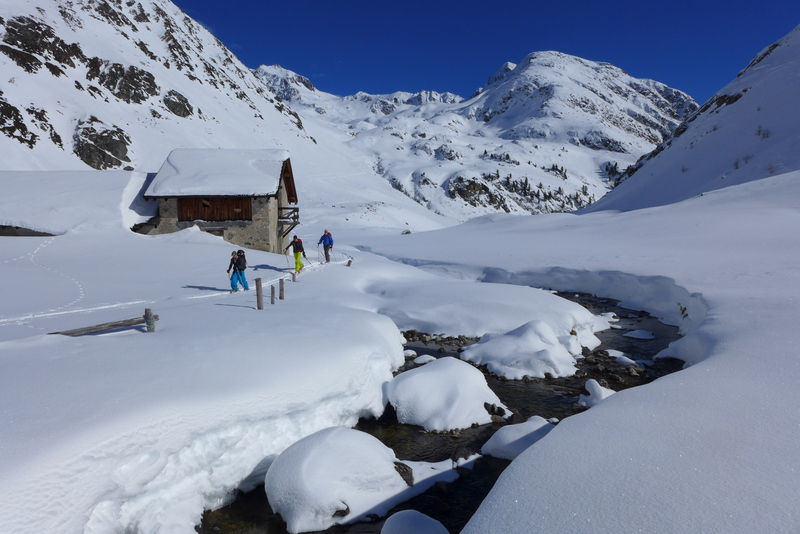 Of course there were risks involved, not just during the expedition itself whilst skiing in the mountains, but also whilst setting the expedition up. Although I had many enthusiastic supporters who backed the project there were also many individuals who were very negative and saw the project as overly ambitious and destined to fail. This is true to all ambition and all challenges in life. Those people who listen to these detractors and are not prepared to take the risk that they may fail to reach their goal accept immediate defeat by not trying. I, for my part, am very glad that we tried and even more satisfied that we succeeded. Ocdt Tara Parks on the Summit of the Wildespitze stage 5. 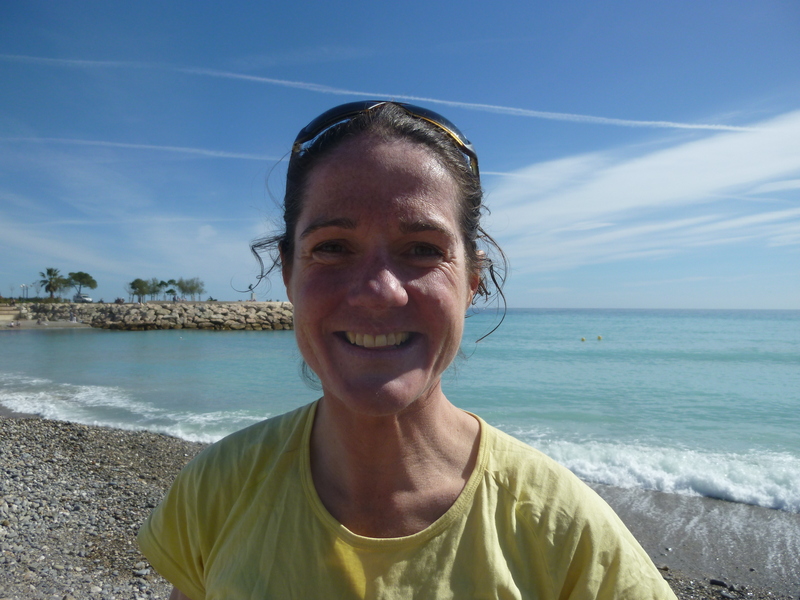 Captain Tania Noakes happy to reach the sea!